SOMEBODY PULLED THE LABOR DAY LEVER – MY 100TH POST. Saturday and Sunday were beautiful end-of-summer days. The last of the kids’ races was enjoyed by parents and grandparents. 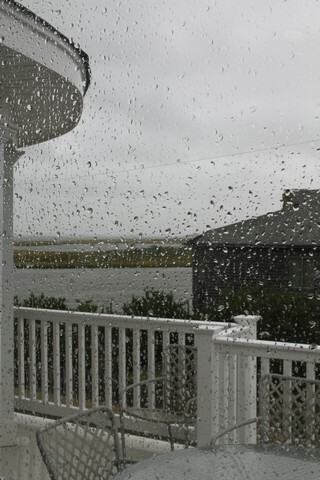 Labor Day, however, dawned unpromising. After lunch the kids packed up (including their dogs and cats to Pearl’s relief) and the house became quiet. Feeling the end-of-season melancholy I went to the beach and endured the chilly threatening wind for a half hour before retreating. 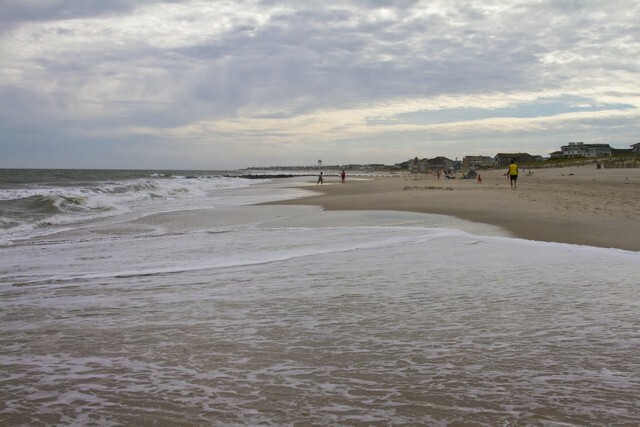 The beach scene fit the idea of the end of the season. Somebody threw the Labor Day lever. 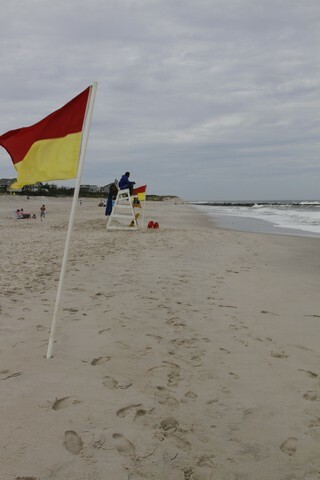 The lifeguard was counting down his last hour on the stand for the season. He didn’t have many people to worry about. The sanderlings which began arriving a few weeks ago will have the beach more to themselves. This morning, the streets are relatively empty; there’s less competition for the last cinnamon bun at the Crust ‘n Crumb; it’s 62 degrees; and the rain has arrived. The rain is adding to the “Go home!” message but that should be ignored. There are many warm, pleasant weekends yet to be enjoyed, and I will. This is my 100th post to this journal which I began in February of 2009, a bit over two and a half years ago. I was encouraged to do it by camera club colleagues Denise Bush and Terry Wilson, and it has been an enjoyable and rewarding vehicle for me. I have posted over 500 of my images, three audio segments linked to images; two video clips; and lots and lots of words. Although my images provide a raison d’être I haven’t regarded it as a photo blog. Most of my photography (digital era) appears in my galleries, over 1500 images in some 160 galleries. I have appreciated the more than 13,000 views of my posts that have occurred, and the over 340 comments that friends have left about my work. Many of my posts are revisited well after posting. 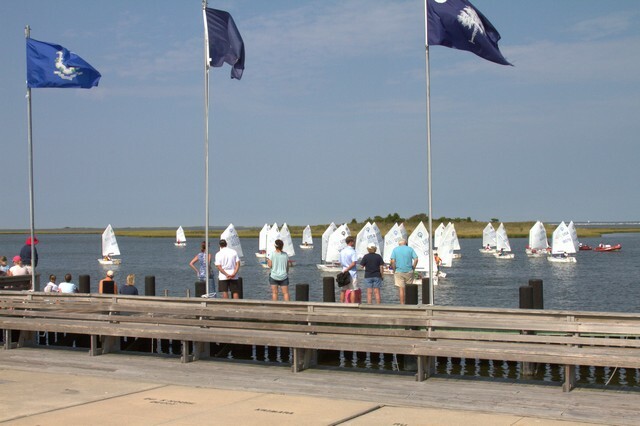 Some all time favorites include Charleston and the Low Country Plantations, the 18th and 19th Century Fairmount Park Houses, and Hurricane Earl. Because even I was having trouble trying to locate a previous post, this past spring I added an index including hot links to jump to a desired post. The index can be clicked at the top of each page or by clicking here. Off you go!!! Waiting for 101 !!! Great work Ralph!!! Thank you, Ralph! I always enjoy your posts. Please keep them going! We’ve enjoyed it all — a great variety of subjects. The birds and water are favorites. Keep it coming, Ralph. It’s always a pleasure to see your latest adventures. Here’s to 200 ! Thanks for the inspiration! Well seeing you are my mentor I am going to shoot low and go for post # 8. I’ll keep bloging as long as you do 🙂 Thanks for opening up my writing voice…. ‘kaChing’… here’s to many more!!!! thanx so much, Ralph for keeping me on your send outs……so enjoyable!. Congrats on your 100th post! 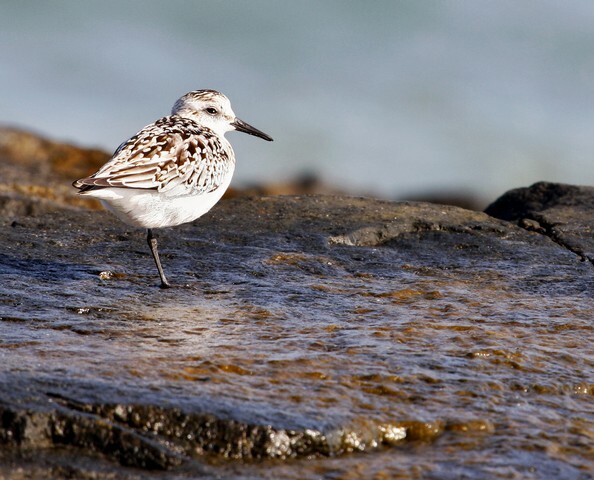 I like the sanderling photo. I didn’t know that they were migratory. D, I just checked Sibley’s Guide and you’re right; it doesn’t say they’re migratory. It just has always seemed to me that they didn’t show up here until mid-August. Sibley says that the bird in my picture is a Juvenile and lists them as Jul-Nov. I really don’t remember seeing any of them until mid-August. Thanks all…can’t talk right now,…writing #101. Thanks, Sally. The site is hosted by WordPress.com. There’s no charge but as I recall they reserve the right to slip ads in although I’ve never seen any on my site. Probably not enough traffic. It’s a fairly easy interface with plenty of options as to appearance. I have had too much trouble trying to be “arty” in the layout of pictures and text and it has been difficult and not usually worked out well. See https://bergiesplace.wordpress.com/2009/10/27/a-train-weekend-102709/ for example. It was frustrating to create and it never did quite come off. WordPress is also dicey if one tries to use a little HTML. Remarkably, I’ve never seen any of this addressed in their forums or in books on WordPress. The software does a good job with a total vertical layout of pictures and with text interspersed. I also use their software downloaded to my server for http://www.BergiesPlace.com That download and support comes from WordPress.org. Once it’s in place it’s stable but downloading a new release or a new SQL release is not for the faint hearted.